Soft, warm colors accent this two room suite, the first bedroom is spacious, with a King size bed, cable TV and DVD player, and private bathroom with sunburst shower. Or the second bedroom can be set up as a family suite with two twins beds. has a world travelers' theme. The first bedroom is spacious, with hardwood floors, Queen size bed and private bath. This suite's second room is filled with antiques, a small library with sitting area, cable TV with VCR, and room for a rollaway. Soft warm colors make this suite style room light and romantic. 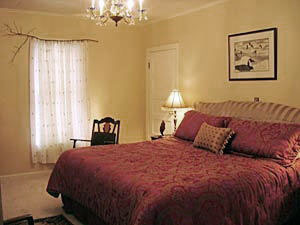 Luxury linens, Queen size bed, cable TV with DVD player, room refrigerator, vintage decor and antiques. Sitting area with love seat to relax and to read your favorite book. New private full bathroom with Jacuzzi bathtub is an added bonus. Queen size bed piled high with pillows adds to the romantic mood of this newly renovated Victorian two room suite. New private full bathroom with Jacuzzi bathtub, vintage fixtures and hardwood floors. This suite's second bedroom has a daybed for reading or relaxing. Or the second bedroom can be set up as a family suite with two twin beds. Queen size bed in spacious bedroom with sitting area, luxury linens, vintage flair and and antiques make these rooms very restful and charming. The second bedroom also has a queen size bed with sitting area. Private full hall bath. This suite is perfect for 2 couples traveling together or a couple with older children. Cable TV with DVD on request. Shared hall full bath. Cable TV with VCR on request.